This material is copyright protected and owned by MEDGUARD SAFES. It can be used by companies that have entered a Reseller agreement with MEDGUARD SAFES. 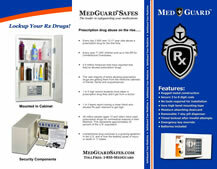 If you need any additional material please contact your MEDGUARD SAFES representative. MEDGUARD Logo used on Safe. The MEDGUARD SAFES knight logo, company name and tag line in png format. Tri-Fold Brochure for end users in PDF format.